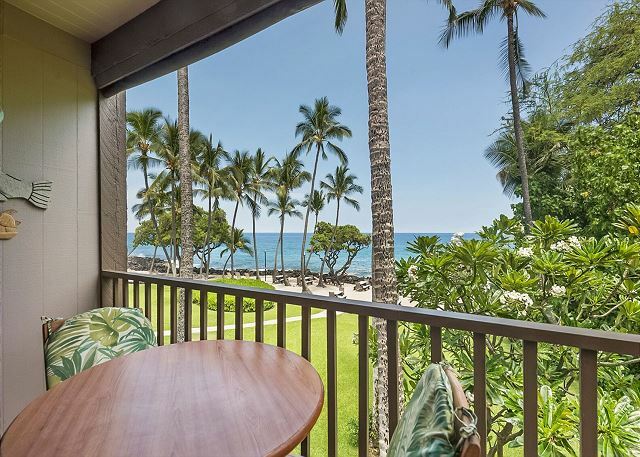 Welcome to Direct oceanfront 2nd floor corner unit, Kona Isle#D21!! 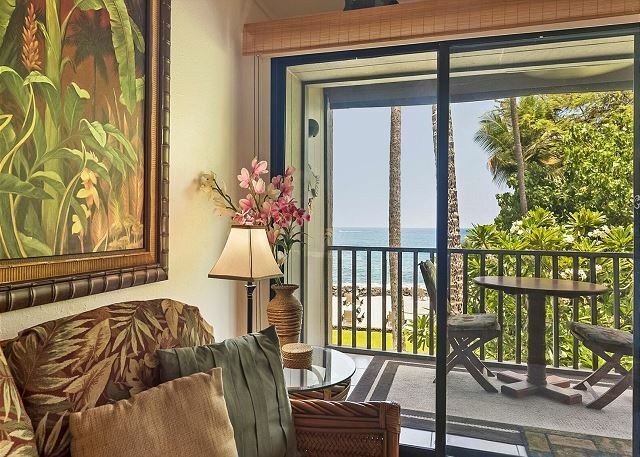 Stunning direct oceanfront views in this gorgeous one bedroom will make you never want to leave.The rhythmic sounds of crashing waves generated by the nearby Pacific Ocean provide a serene soundtrack to peaceful meals from the lanai, which overlooks immaculately maintained grounds. 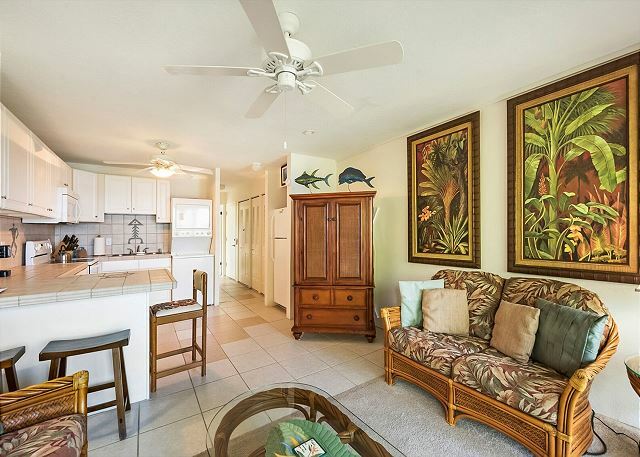 This second-floor end unit is located in one of the more peaceful parts of the quiet Kona Isle complex. We had a wonderful experience with this condo. The unit was clean and up to date. We enjoyed the view from the deck and eating dinner at the tables provided on the beach. All the essentials, beach chairs, umbrellas, towels and coolers were provided. We would rent this unit again. 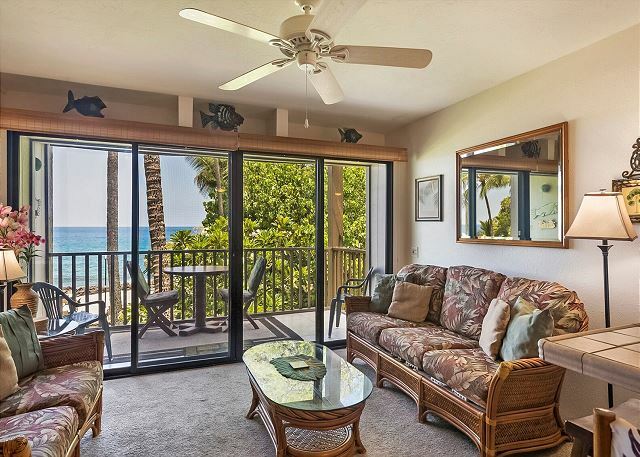 This condo has an ocean view and is close to downtown Kona and the Kona airport - so the location is very convenient. I enjoyed being able to look out and see the waves, watch dolphins (through binoculars) and be lulled to sleep by the sound of the ocean. 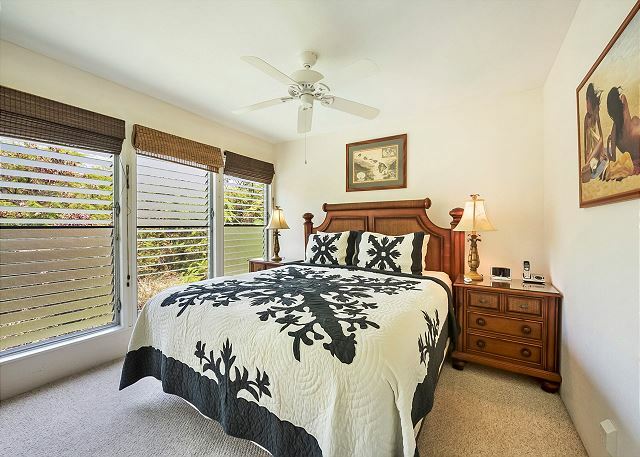 Pros: location, ocean front, close to several beaches, beach gear available in the condo (snorkels, fins, boogie board, beach chairs, beach games, beach bag), mostly quiet location, parking for 1 vehicle. Cons: no air conditioning (air flow and ceiling fans), being on the 2nd of 3 floors, when there is someone using the unit above there is quite a bit of noise (especially when they move chairs on the balcony or cleaning crew is in the unit), construction next door starting at 8am. The Pros outweigh the Cons, just wanted to outline both, great place to stay! 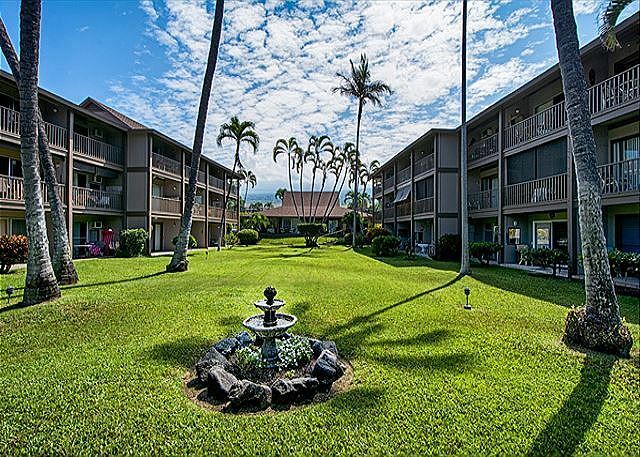 Kona Isle is a small, neighborly condo complex right on the ocean and close to downtown Kailua-kona. It's a mixture of long-term full year residents, winter residents, and tourists. It has a friendly atmosphere and all are welcomed. There are beautiful lawns and landscating, a private beach with picnic tables and barbeques. From the beach or oceanfront condos, you can watch whales breech and dolphins swim by. 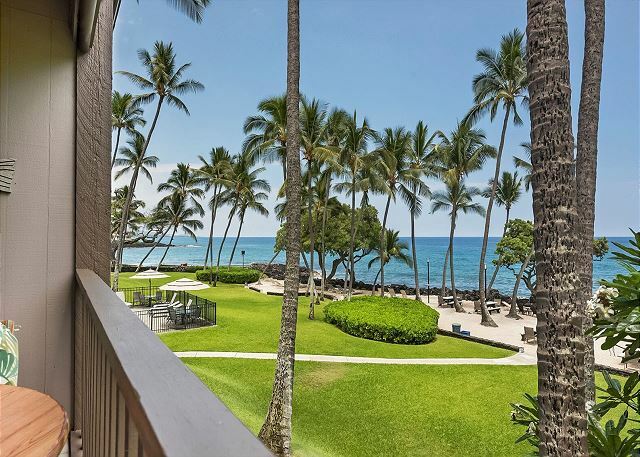 D21 is full oceanfront with an exceptional view of the lawns, beach, lava rocks, and ocean, with glorious sunsets. The whole western wall is glass and there is a very usable lanai (deck). It's clean, very comfortable, and well stocked with an open, spacious floor plan. Washer/dryer and dishwasher are in the unit. King size very comfortable bed. Nice bathroom with walk-in shower. Tile and carpet flooring. The management company is responsive and takes care of any problems. I highly recommend this unit. We had a lovely vacation on Big Island. It was our first time visiting Kona and we will be back! We we’re very pleased with our stay at Kona Isle D21. We typically vacation in Maui but we have now found another perfect place to enjoy! We were very pleased with the close proximity to the town but not to close either! The people running the facility were very nice! We’ll be back for sure! We are very satisfied about our stay in Kona. Your people were dedicated to assure us a everything we need and our confort. We really appreciate teh extra like : beach chairs, cooler, beach towels, beach umbrella and so on . The only problem was the outside sliding doors who was difficult to open and close. The condo was spacious and comfortable and had absolutely everything we needed, including things we wouldn't have thought of. Beautiful view from the lanai. Easy to get to and from other places although a car is very useful unless you are fit and active, and used to the heat. Market and a convenience store handy. No air conditioning which might be a deal breaker for some these days. Very nicely furnished condo. The gtounds at Kona Isle are very well kept. All was well untilI the plastic chair on the lani collapsed. Other than that, it was very nice. Wonderful location on property afforded privacy, serenity with a beautiful view of the ocean. The fans kept the unit tolerable temperature during our stay but were a bit difficult to figure out. Loved the books available to discover the island. 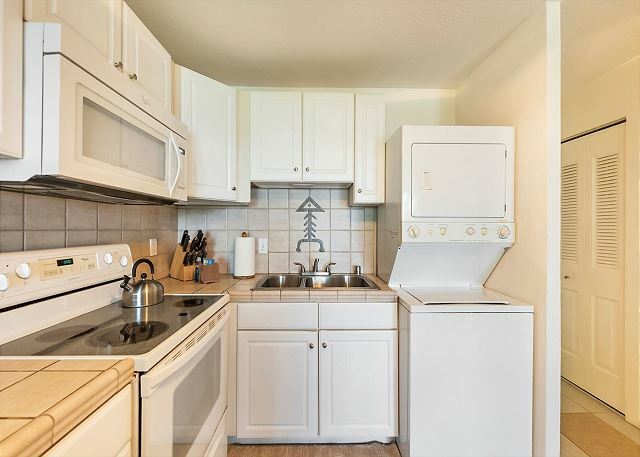 Some upgrades, equipment and condiments in the kitchen would make the unit more desirable in our opinion. Sheets and towels should be upgraded as well. Overall the unit was very pleasant and we enjoyed our stay. We enjoyed our stay in D21,third year staying in this condo. We had a couple of issues and contacted Blake at Knutson. He very quickly took care of them the same day. We have rented from Knutson for many years and always have been very pleased with the service we receive from them. Thanks again Blake for taking such good care of us. Such a great time staying at Kona Aisles. The view is EXACTLY like the pictures and the suite was more than what we had anticipated. 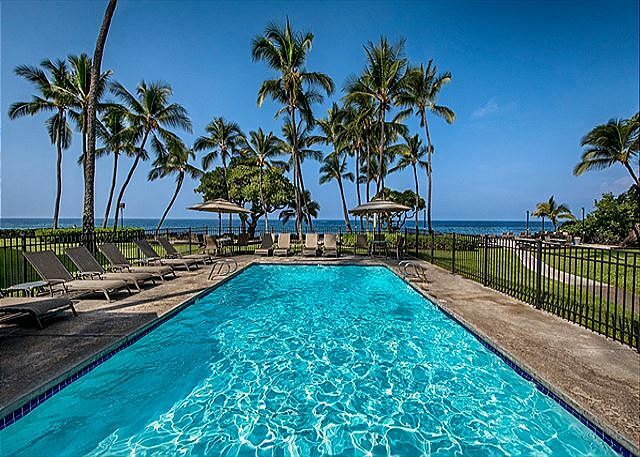 The location is fantastic, walkable to the best Kona restaurants in one direction, and walkable to the coolest Magic Sands beach in the other. LOVE IT HERE! Great location, nice condo, best view, fantastic grounds and amenities. I would recommend this condo and would stay here again. The lighting in the condo could use some upgrades. Aloha Gregg, Thank you so much for your comments on our direct oceanfront Kona Isle D21! We will certainly look into your suggestions about the lighting, specifically. We hope to welcome you back again in the future! -Knutson & Associates, Property Management. We stayed on Big Island April 16th'16 for a week. 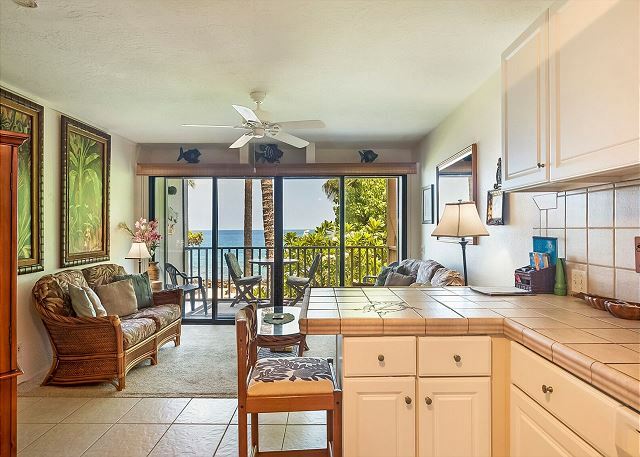 We chose this condo based primarily on the picture of the lanai as we could really envision ourselves having breakfast there. We were not disappointed! That's where we ate all our meals when we were not off exploring the island! The condo is a corner unit on the middle floor of a 9 unit building, which is good as it allows natural ventilation from the side windows as there is no AC. The grounds were very well kept, just as seen on the pictures. It was clean and well equipped to cater to our needs, including beach chairs, umbrella, small portable cooler and snorkeling gear! We fell asleep every night (on a great mattress) to the sound of the waves and woke up to them and to the birds chirping. It was fabulous! This is our second stay in this unit. We love the view and it is so quiet there. We are very pleased at what the unit it equipped with, from the kitchen to the comfortable bed. We have already booked for 2017. Stayed in this Oceanfront Condo Sept 2015. Very happy with the location away from the busy Kona town area. The BR window in this corner unit faced the natural landscape making it very private & quiet. Listening & watching the ocean from the condo was wonderful. Wir verbrachten sechs sehr erholsame Tage in der Ferienwohnung.Die Wohnung war sauber, ruhig und sehr gut ausgestattet. Alle Mahlzeiten konnten wir auf dem Balkon einnehmen mit einem wunderbaren Blick auf den Ozean und die vorbeischwimmenden Delfine. Wir können die Ferienwohung jederzeit weiterempfehlen. The condo had an amazing view! From our lanai we saw many whales and dolphins each day. The dolphins were fun to watch as they enter acted with the snorkelers. The whales were amazing to watch when they breeched out of the water. A great unit with all the amenities- ocean view, washer/dryer, dishwasher, many fans to help keep cool, lots of beach and snorkel gear to use, grounds well maintained including BBQ area, WiFi, and more. We will go back to this unit in Kona Isle. I'd take any babe to D-21. Knutson is a perfect management. Got a problem, call them and it's fixed.Everything you need. Could use "two" sand chairs, but one worked for me. Seating in living area could be more comfortable. Je suis vraiment satisfaite de cette réservation on ne peut rien demander de plus je le suggérais à tout ceux qui veux passer un très bon moment a kona. Nous avons passer 10 jours, et cela été parfait, s'endormir avec le son des vagues et se réveiller avec le son des vagues et le champs des oiseaux, que demander de plus? The condo was nice and well provided with everything needed for stay, ie kitchen utensils,bath towels etc. of the waves were so peaceful we slept great. I would highly recommend Knutson & Assoc for their professionalism and commitment in ensuring a pleasant and stress-free stay. They went above and beyond, a special thanks to Shay and Sharon. Great Condo, right on ocean front in quiet,well maintained complex. Complex has pool, BBQ grills, outdoor area to eat/watch spectacular sunsets and nice gardens. Follow the trail next to the grills to get access to ocean front and tide pools. Condo was stocked with all we needed and very clean. This unit has no AC but fans in each room including lani which made very acceptable. Watch the waves break and dolphins from your lani! only ocean front are private from busy neighbor eyes. If you are seeking perfection and pool boys to mist you with Evian, this is not for you. No one will bring you tropical drinks or turn down your bed. This place is reasonably priced and ocean front. Waves crashing and birds chirping. It's not luxurious, but comfortable. The kitchen has everything you will need and the closets are filled with snorkel gear, coolers and beach paraphernalia. (A welcome surprise) Kona Isle was the perfect base for exploring the island. I can't wait to return. 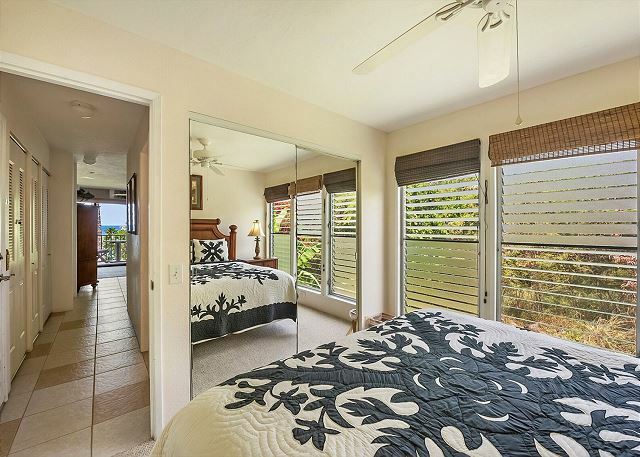 I recommend this property to everyone who wants to enjoy a perfect vacation in Kona.